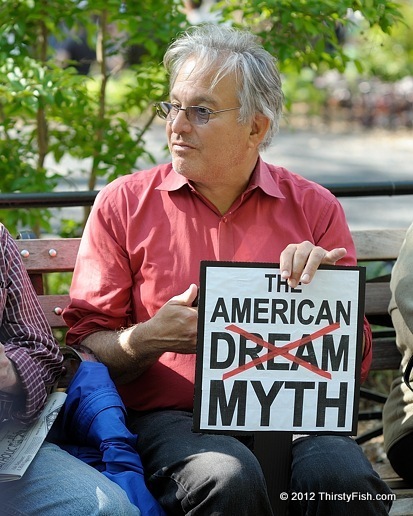 The American Dream / Myth? The American Dream is an often repeated ethos, that in America, freedom and opportunity leads to prosperity and success for those who work hard. This egalitarian concept has been criticized by many who point to the modern American wealth structure where there is little evidence to support success and progress between generations. Racial and class inequalities generally remain. Research suggests that, upward occupational mobility is about the same and income mobility is lower in the United States than comparable societies: "By international standards, the United States has an unusually low level of intergenerational mobility...". Land of opportunity? Numerous authors, Scott Fitzgerald, John Steinback, Arthur Miller, Hunter S. Thompson, Hubert Selby, and George Carlin, and others, have dismissed the "American Dream" and criticized it for inflated expectations and for promoting material success, rather than spiritual happiness. George Carlin framed the American Dream perfectly: ""it's called the American dream because you have to be asleep to believe it".